With absolutely no idea what I'm talking about I would like to try forming silver (ie, I'd like to make stackers). I have access to a kiln and a 20 ton press (and a friend who knows how to use them). I assume I can have a top and bottom die and sleeve made out of steel. Get a graphite mold roughly to size for initial casting. Melt/cast in furnace, allow to cool but while still malleable, drop die mold and squeeze with the press. Am I over simplifying what is really a complicated (ie, expensive) process? Does this mean it is not possible? You could still pour bars/coins etc and then have a die produced to stamp them once they are cooled. It seems plausible that you could achieve stacking. bars will be completely cooled when pressed. I'm thinking 100 gram or less. I'm also thinking of round as opposed to square. As a cheap test I am thinking of getting a steel pipe (say 1-1.5 inches in diameter) to use as a sleeve. I would use a half inch male socket on the bottom and a 3/8 inch female socket on top. So, I put the male socket into the pipe, melt silver in a graphite cylinder, let it solidify but while still hot drop into pipe. Drop female socket onto silver blob and then press with 20 ton press. Is there any chance this would work? How are you going to line them up so that they stack? "Dropping it on the blob" doesn't sound very scientific or accurate. Edit: half inch Male and 3/8 female?? Isn't he too big to fit inside her? 1- the same / better results can be obtained from properly annealed metal at room temp. Why not produce a die to be used with your press, and buy 1 oz silver blanks from SilverTowne? They are available in 1 oz bar and round configurations. I can definitely understand how changing the tooling metal temper would be disastrous. My concern is that room temp material wouldn't be malleable enough to form to the mold with only a 20 ton press. Bucketeer wrote: Why not produce a die to be used with your press, and buy 1 oz silver blanks from SilverTowne? 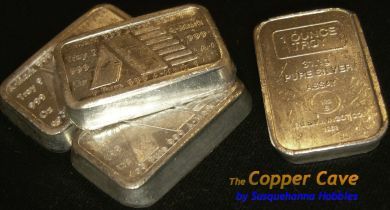 They are available in 1 oz bar and round configurations. If it were possible my goal would be to form pellets of a given weight and diameter through casting then shape them into a unique stackable shape using a top/bottom die and sleeve. My idea above is a visualization to ask if it is feasible with tools at hand. Assuming success I would design and have made the top/bottom/sleeve tool to use in the press. Iwant2beu wrote: If it were possible my goal would be to form pellets of a given weight and diameter through casting then shape them into a unique stackable shape using a top/bottom die and sleeve. My idea above is a visualization to ask if it is feasible with tools at hand. Assuming success I would design and have made the top/bottom/sleeve tool to use in the press. You've got the overall concept correct. But take heat out of the equation (adds complexity and cost for little gain over room temperature annealed silver) and I wouldn't expect to go any bigger than an ounce with a 20-ton press (that may even be a struggle depending on how dramatic the stacker features are). The old A-Mark stackers were made the way you are thinking. You can see they have much less dramatic features than the Scottsdale style stackers (even so I suspect they were stamped on a press greater than 20 tons).